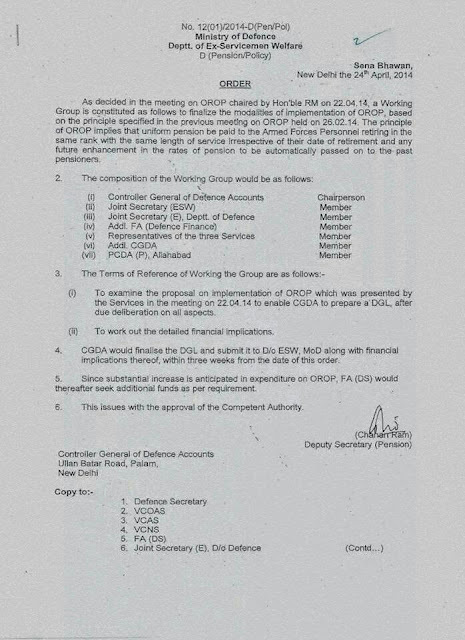 THE ORDER OF 24.4.2014, ISSUED BY MOD (DoESM) IS POSTED HERE AGAIN, FOR THE BENEFIT OF THOSE CONFUSED ON THE DEFINITION OF OROP (PECHIDA). 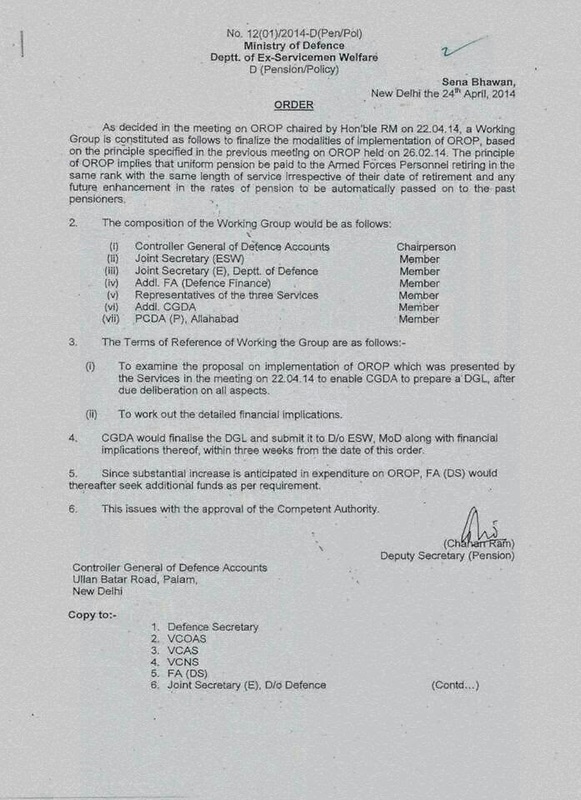 It states that it was decided to constitute a Working group to finalise the modalities of implementation of OROP, based on the PRINCIPLE specified in the meeting chaired by RM on 26.2.14. The OROP PRINCIPLE implies that uniform pension be paid to the Armed Forces Personnel retiring in the SAME RANK with the SAME LENGTH OF SERVICE irrespective of their DATE OF RETIREMENT and any FUTURE ENHANCEMENT in the rate of PENSION to be automatically PASSED ON to the PAST PENSIONERS. The Composition of the working group does not have the very stake holder i.e. ESM reps.
i) To examine/deliberate on the Services HQ presented proposal on OROP implementation in previous meeting on all aspects and enable the CGDA to prepare a DGL. ii) To work out details of financial implications. The FA (DS) would thereafter seek additional funds as per requirement, since substantial increase is anticipated on OROP expenditure. And lastly, the order was issued after approval of competent authority. SIR, I HAVE THE FOLLOWING DOUBTS. 1. THE RM LOST THE ELECTION AND A LOST MP BECAME RM (PART TIME). 3. THE DEFENCE SECRETARY HAS BEEN CHANGED. 4. THE VCOAS, VCAS, VCNS WERE CHANGED. 6. THE JS (E) D/O DEFENCE.....I DO NOT KNOW. 7. THE GOVT AT CENTRE IS CHANGED. 8. GOVT AT DELHI CHANGED. 10. 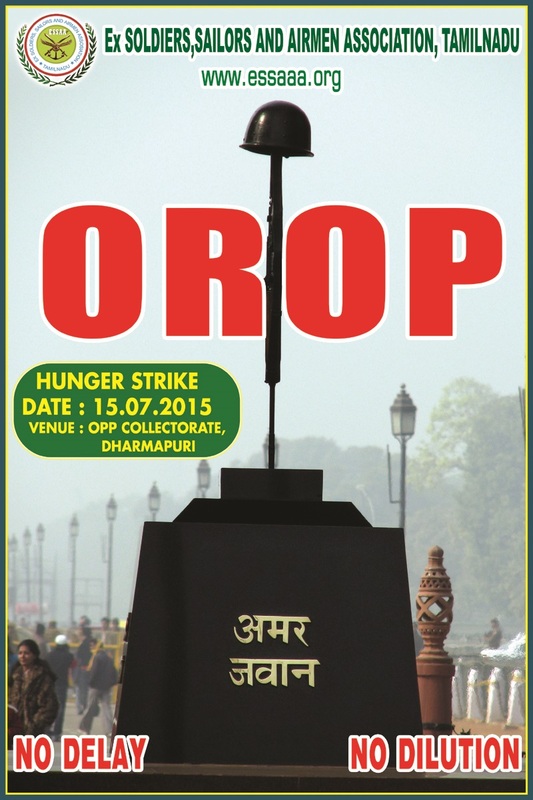 THE STANDS OF POL PARTIES ON OROP IS NOW CHANGED. AND NOW THE THINKING OF ESM/SM CHANGED. 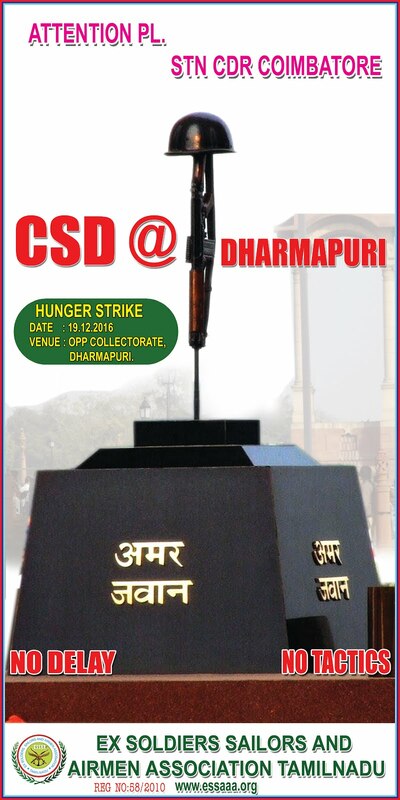 BUT NOW I AM CLEAR IN MY MIND THAT ----COME WHAT MAY, THE ONE RANK ONE PENSION SHALL AND WILL HAVE TO BE IMPLEMENTED, WHETHER SOMEONE LIKES IT OR NOT..